Andrias Bok (31) is a lucky man, but as he agrees immediately when you meet him, recognising opportunities when they come your way and working hard to make your dreams come true, are a large part of his success. Born in Springbok in the Northern Cape, Andrias' golden opportunity came when he starting working in the kitchen at Naries Namakwa Retreat, one of two properties owned by Paarl's d'Olyfboom Family Estate proprietors, Danny and Garitha de Wit. 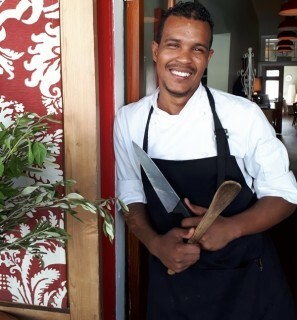 "From 2005-2008 I helped out in the kitchen at Naries but only when Julene Hamman, a professional chef arrived from Arniston, came to take over, I realised what it meant to be a chef," Andrias explains. Julene saw his potential and soon he was on his way to Hermanus for a 6-month course at the Warwick Chef School. After completing the course, Andrias returned to Naries as head chef where he met up in 2015 again with one of his Warwick contacts,Noop Restaurant owner Zian Oosthuizen,who offered him a position at his highly rated popular restaurant on the Main Road of Paarl. Towards the end of 2015 Andrias started at Noop and is today ensconced as one of the team stalwarts. When asking Andrias about his own personal favourite food,it's pasta all the way! "Lasagne is my mom's favourite and to this day I still love making it. I also love sweet chilli sauce and use it often in my pasta sauces and when I'm preparing that real South African favourite, boerewors." "In the restaurant I'm proud of my crème brulee and especially once when a French visitor to Naries said that it was the best he'd ever eaten!Coming from a Frenchman – that was a real compliment," laughs Andrias. His favourite ingredients are the classics:Salt, Pepper, Parsley, Onions and Garlic. "Without these no chef can cook," he says. With his long-time girlfriend still based in Springbok, Andrias has a strong connection to Namaqualand and often visits "home", but in future would like to work in an upmarket Hotel to get more experience in a traditional hospitality set-up. This might take him even further away from the Northern Cape and his family, but he sees it as a necessary part of his growth. "If it wasn't for Danny, Garitha and Julene who helped me to realise my potential, I would not have been where I am.In my younger days I saw chefs on TV and enjoyed watching them,but little did I know then that my future would be linked to food and the hospitality industry –and I love it!" Andrias Bok at the entrance of Noop in Paarl.